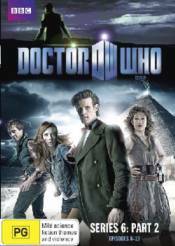 The truth about River Song is out and the time has come for the Doctor to face his greatest demons. Venturing across centuries and galaxies, the Doctor, Amy and Rory will encounter the greatest war criminal in all of history-and Hitler. Together, they'll discover there's no scarier place in the universe than a child's bedroom and a visit to an alien quarantine facility will reveal to Rory a very different side to his wife. In a hotel where walls move, corridors twist and rooms vanish, death lies waiting. But the Doctor's time has yet to come. He has one last stop to make on his final journey - an old friend needs his help and an old foe must be defeated. But time catches up with us all and the Doctor can delay no more. By the shores of Lake Silencio, in Utah, all of time and space hang in the balance. And a NASA astronaut is waiting.